For Israel's Volunteer Police, Many Powers But Little Oversight : Parallels Most of the police you see on the streets in Israel are actually citizen volunteers. They outnumber the country's 30,000 professional officers. Israeli police conduct searches at the Damascus Gate in Jerusalem. Israel's 30,000 professional police officers are outnumbered by volunteers. Jonathan Javor remembers the car thief with relish. A political strategist by day, the 34-year-old volunteers a couple of nights a month as a police officer in Tel Aviv. During one recent shift, he and his partner, another volunteer, responded to a call from a citizen who was watching someone trying to steal a car. They were the first officers on the scene. "They had the dodgy car, they had the dodgy look. They had the tools," Javor remembers. "They had already tried to break into one car. We called for backup, we stayed hidden, waited to make our move and caught them in the act." That was a "good patrol," he says, getting a couple of bad guys off the streets of his city. Javor is one of 33,000 Israelis who volunteer with for the national police. The number of police volunteers tops paid staff; according to a department spokesperson, Israel employs 30,000 professional police officers. Javor not only volunteers, he recruits others to help out as well. Originally from Britain, he runs a program focused on getting other immigrants to volunteer. Israeli security forces inspect the crime scene in Jaffa after a Palestinian stabbed and killed an American on March 8. The attacker was shot and killed by a volunteer policeman. "You're contributing to the security of the country, to the security of the people," he says. "You can still be a pioneer here, you can still contribute, you can still build." Most volunteers — who are not paid but are supplied with free uniforms and shoes — work as patrol officers and traffic police or help with crowd control. They are incorporated into the shifts, getting briefed along with professional officers and staying in touch via radio during patrols. Seven thousand assist Israel's border police, operating in and around the West Bank. Others help with search and rescue or investigations. The government has calculated the value of Israel's police volunteers as equivalent to 2,000 extra full-time officers, a 6 percent boost in the force. Volunteers can start as young as 16 years old. Most, 85 percent, are male. Many U.S. police departments also use volunteers, but in a much more limited way. New York City, for example, employs 36,000 professional officers and incorporates 4,200 volunteers. As in Israel, New York's police volunteers wear uniforms. But in New York, their badges identify them as "auxiliary," while Israeli badges do not differentiate. NYPD volunteers can't carry guns or arrest people. Israeli volunteers can do both. 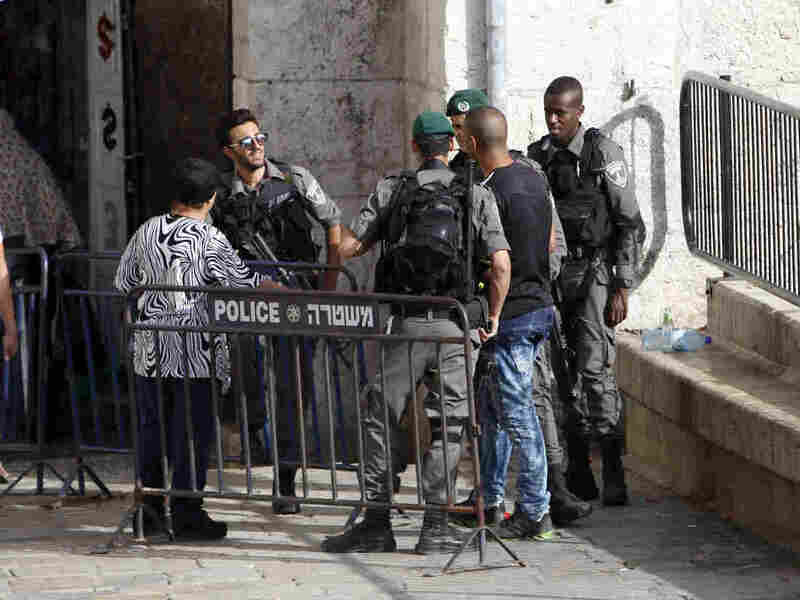 "Once they've gone through their 20 hours of training, they're fully qualified police officers," says Mickey Rosenfeld, a spokesperson for the Israeli police. "They have the same authorization as the regular police officers who have served five, 10, 15 years in the Israeli national police force." Israel's police volunteer corps was started in 1974, after a series of Palestinian terrorist attacks, including one on an Israeli school that killed at least 16 students. Responsibilities have varied over the years, as have the numbers, with at times more than 100,000 Israelis serving as police volunteers. But they always must be ready to respond to terrorism, says Rosenfeld. "They could be in Jerusalem, looking for stolen vehicles. And they might have to confront a terror attack that can take place at the same time, on [the] same shift," Rosenfeld says. "They don't take a step back because they're volunteers, and then call the anti-terror unit to come in." 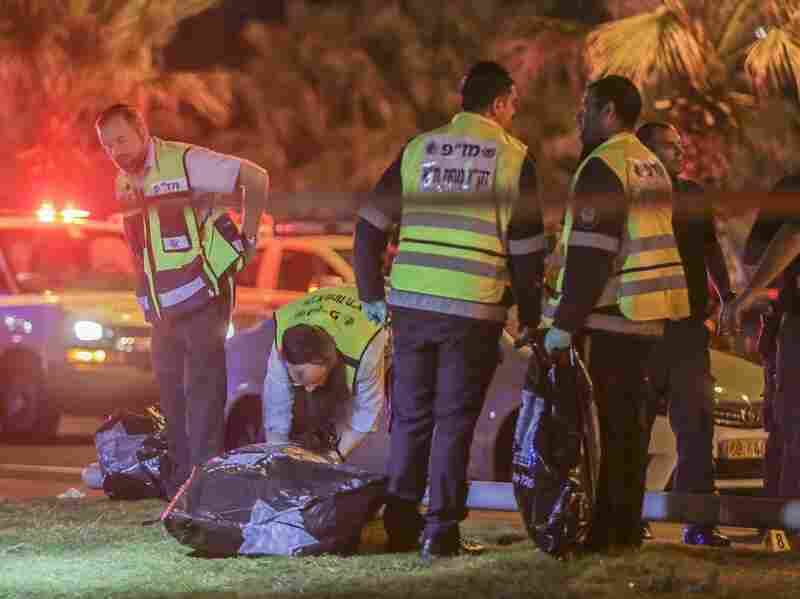 When an American was stabbed to death on the beachfront near Tel Aviv in March, an Israeli volunteer police officer shot and killed the Palestinian attacker. In a handful of other cases over the years, volunteer officers have killed suspects. In such incidents, volunteers can face internal investigations, just like professional police. But in this country, proud of individual contributions adding up to a nation, human rights organizations that are critical of the police have focused on issues other than volunteers, such as privatization and general police tactics. The importance of volunteerism is a deeply fundamental aspect of Israel's sense of itself. Even the military relies heavily on reserve troops who may do just a few weeks of duty per year. Erella Shadmi, a former Israeli police officer who writes about security and discrimination, says she is "not against volunteers" but wants more oversight. "Instead of giving money and sitting in a castle, you know, at least you're doing something for your neighbors," Shadmi says. "I'm not against it. I'm against giving them the powers." Shadmi believes there is not enough re-training in how to serve civilians for the many former soldiers who volunteer as civilian police. But police spokesman Rosenfeld says military experience is a plus, since army veterans come with tactical and firearms training. The military is more popular than the police in Israel. Steven Popper, a senior economist with the RAND Corp. whom Israel hired to assess its policing, compares the military (known formally as the Israel Defense Forces) and police to sons competing in one family. "The older son, this would be the IDF, is lauded by the parents, considered to be a paragon. The mistakes the older son makes, the costs he imposes on the family, are largely just shrugged off," Popper says. "And the parents turn to the younger son, in this case the police, and say, 'Why can't you be more like your older brother?' "
Like the military, Israel's police answer to national politicians, not mayors or governors, as in the U.S. This structure is good for national security, Israel's highest priority, says Badi Hasisi, director of Hebrew University's Institute of Criminology. He also warns that having no local control elevates tensions between police and minority populations. He cites ultra-Orthodox Jews, Jewish Israelis of Ethiopian descent and Arab Israelis, who make up 20 percent of the population, as groups who struggle frequently with police. "They have issues with the, let's say the dominant group, in society. And who you end up clashing with? The police," Hasisi says. Protests over police treatment of Ethiopian Israelis turned into street clashes with cops last year. Israel is trying to diversify its professional force. In the ranks, there's hardly any diversity — and that goes for the volunteers as well. But this spring, Israel appointed a Muslim Arab Israeli as a deputy police commissioner for the first time. He'll be tasked with recruiting more Arab officers, as well as lowering crime rates within Arab Israeli communities. Only a tiny fraction of police volunteers are from Arab Israeli and other minority communities, says police spokesperson Rosenfeld. A recent government report criticized the volunteer program for recruitment that doesn't match force needs, poor basic training and too little attention paid to the complexities of giving law enforcement authority to volunteers. Israeli-American David Weisburd, an internationally recognized policing expert, says this perhaps loose approach to managing volunteer officers reflects some of Israel's character. "It's a very small country, faced with many big problems, and in that context some things become more informal than they might be in the States," he says. "Sometimes that works, and sometimes it leads to problems."